Rural residents know that a 911 call to law enforcement may result in an hours long wait for a response. On Wednesday, the Sacramento Bee posted the culmination of several months of research into the problem. Leading the article is the story of how in March of 2011 a Trinity County couple, Jim and Norma Gund, had their throats slashed by a murderer when they responded to a request from a Trinity County Sheriff Cpl. Ron Whitman to check on their neighbor who had called 911 for help. Whitman was almost 100 miles away in Weaverville. According to a California County map included in the article, Trinity County has 1.1 sworn deputies per 100 square miles. Humboldt has 5.1. Del Norte has 2.4 and Mendocino County has 3.5. The article looks at how this low staffing affects response time and policing. The Bee’s article also brushes on the limited number of mental health professionals in rural areas and looks more deeply into how rural economies are affected by protected state and federal land (acreage not in private hands is not subject to property tax which is a mainstay for budgets in rural counties). The story of Jim and Norma Gund is so compelling though that the Bee also published another article simultaneously about their ongoing court cases with the Trinity County Sheriff’s Office. The article is titled: This couple was attacked by knife-wielding killer. Did their sheriff put them in harm’s way? The Gunds were brutally attacked when they entered a home near the Kettenpom airstrip in Trinity County after being sent to the scene on March 13, 2011, by Whitman, who the couple says failed to inform them of the potential danger they were facing. Instead, Whitman told them the 911 call he was asking them to respond to was likely “weather related” and he never mentioned that the caller had whispered “help me,” that the dispatcher had relayed that it sounded likely the person was attempting not to be heard or that no one answered when the dispatcher called back, according to court documents. Earlier this month, the California Supreme Court agreed to hear couple’s $10 million civil lawsuit against Trinity County, alleging negligence for misrepresenting the emergency situation and withholding important details that indicated a serious crime was underway. 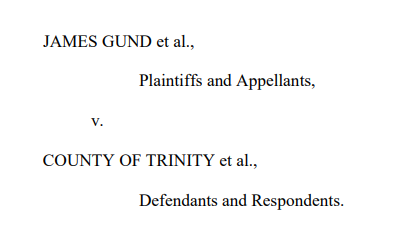 The Gunds are being represented in the state’s highest court by local attorney Benjamin Henry Mainzer of Bragg, Mainzer & Firpo, LLP after an appellate court upheld a Trinity County Superior Court decision in the county's favor that found the couple is only eligible for workers’ compensation because they were essentially working on behalf of law enforcement when they agreed to respond to the call. Meanwhile, a separate federal civil rights case is on hold while the state litigation runs its course. The Third District Court of Appeal’s June published opinion — which means it’s citable case law — acknowledges that Whitman “misrepresented that the 911 call was likely weather-related and omitted facts suggesting criminal activity” but states that those factors were “irrelevant” to the state statute the panel of three justices was considering in the case. Meanwhile, Jim Gund, in an interview with Redheaded Blackbelt, said he and his wife “have turned our horse ranch into a place where kids and adults can come and ride and learn horsemanship.” He explained that no one is turned away, regardless of ability to pay.